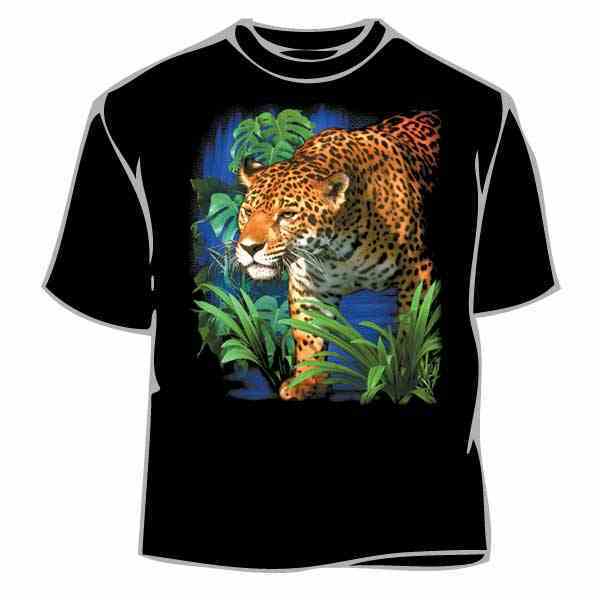 Leopard In Jungle T-Shirt - This wildlife t-shirt print is for light and dark tee shirts only, under our wildlife and animal tee shirt section featuring leopards. Our leopard t-shirt makes a great gift for anyone who loves the leopard and this tee shirt comes in sizes up to a 5x and your choice of any color of the tee shirt. The animal tee shirt features a leopard walking in a jungle. Our animal tees are a first quality tee shirt, made of a 100% cotton tees, with a seamless collar and a double needle sleeve and bottom hem. Our wildlife tee shirts are incredibly comfortable and not only look great, but are made to last. If you have questions regarding our leopard t-shirt or any of our other animal merchandise, please email us with the product name and number.